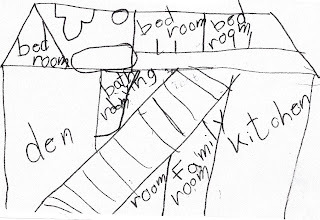 This is the first floorplan I drew at age 6. My parents passed along some keepsakes recently and I found this sketch. I drew it on the back of a church donation envelope at Easter service in 1982. Not sure how one would access the 'corner' bedroom....but the stairs are easy enough to see! I thought this was pretty funny but the diving team photo not so much- so I will pass on posting that memory.